While the debate over the validity of Gareth Davies' try continues on social media, it's time for us to say goodbye. Thanks, as always, for joining us. France's victory over Ireland was forgettable, but Wales and Scotland put on a fine spectacle for us. What will England and Italy serve up? England take on the Italians, who are licking their wounds after a narrow opening day defeat by France, in Rome on Sunday. "England could be vulnerable against Italy"
Unbeaten France are top of the pile, though they haven't do so with panache. Wales are second, but England will leapfrog them if Italy are defeated on Sunday. Gareth Davies' try - should it have stood? "When Dan Biggar kicked the ball Gareth Davies was offside. Jamie Roberts then puts everyone onside when he chases and taps it back - bar Gareth Davies. Roberts never got ahead of Davies, so as soon as he touches the ball Davies is offside. "If you're speaking to any of the players who have been in France they're so far behind in terms of fitness. When they come back to their national sides they're not fit enough." "Flair sucked out of French rugby"
John Inverdale and co are now chatting about France's victory over Ireland in Paris. It was a turgid affair, but the 10-9 victory keeps the French on course for a Grand Slam. "Wales are a great side"
"Sometimes you have to win ugly"
"It's a real conundrum for the Welsh management and the team - how are they going to progress. They are trying to expand but they're not there yet. "His try wasn't a pre-worked move, Jamie's just seen that." "Wales won because the better side started to play better. The Welsh players are better than the Scottish players and as well as the Scots played, we should remember that Wales came into the Championship as favourites. "Scotland played well in the World Cup but they have a poor record against sides above them in the rankings - the expectation is too high on Scotland." Scotland head coach Vern Cotter is a dejected man. "It doesn't get any easier," says Cotter. "I don’t like losing. The information from that game will make us grumpier and will help us push for that win. The attitude was better so if we can build on that we can keep on improving. We need to get better at stopping teams scoring." The match is over, but the talking continues in the Six Nations Forum which you can watch on this page or on the Red Button. 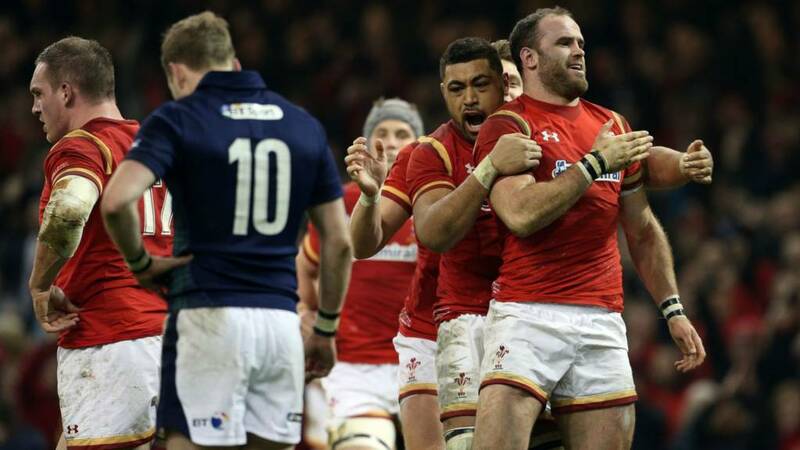 "There's too much expectation on this Scottish side to win games," says Jeremy Guscott. More from Wales wing George North: "The game itself was a quick game. The first half didn’t lend itself to wing play – there was a lot of turnovers. We can improve in certain areas – being a bit more clinical with certain things and keeping teams penned in." Scotland have yet to beat Wales in the Warren Gatland era. It's now nine straight defeats against the Welsh. Here are a few stats for you to chew on. "In the second half we came out strongly," says the Wales winger. "We came out with the points we needed and sometimes you've got to win ugly to keep going. "The form Scotland had in the World Cup and coming here today, we knew they were a team with quality. Considering we had a six-day turnaround, the character the boys showed was outstanding. "The way we played today, we can definitely improve on some things."